By My Side tells the story of Cass Brooks and what happens when she is tragically hit by a car and wakes up with a spinal cord injury. Unable to walk, she thinks her life is over; she loses her boyfriend, her job and her life as she knows it. All her friends and family worry about how they can help her rebuild her future but Cass feels that there is nothing anyone can do. In fact life hardly feels worth living. It is only when she comes across Canine Partners and is introduced to a wonderful golden Labrador called Ticket that she starts to see a glimmer of a new life. With the help of new friends, many of whom have injuries worse than Cass, and her family who refuse to give up on her, she starts to embark on a life that is obviously different from her old one, but in its own way is rich and fulfilling. I absolutely loved By My Side and I can’t remember reading a book that has made me cry so much, albeit in a good way. I was moved from the very first page and found myself passionately caring about Cass and her future. It was also a book that really made me think about my own life and count my blessings. It’s the sort of injury that could happen to anyone and it does make you wonder how you would deal with such a devastating blow. By My Side is a story that is filled with hope though and hopefully would inspire anyone going through the same thing. 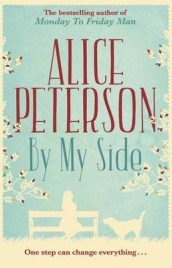 By My Side is a beautifully written book that had me hooked from the very first page. The characters felt so real and I found myself caring about each and every one of them. This is a book that deals with difficult issues but is not in any way a sad book. I found it both poignant and uplifting and I felt quite lost when I came to the last page. I would love there to be a sequel. I have always enjoyed Alice Peterson’s books before but this one has taken me to another level of enjoyment. I heartily recommend it as a lovely, thought provoking read. No Comments on "By My Side"